We are in the home stretch now for 2009. How we finish is very important. We must finish strong! Several years ago I ran in a Race for the Cure event here in Tulsa. It was not a long race but I wanted to run in honor of my mom who has beat the cancer trifecta. She's a real champion! As I started the race I was very excited and proud and filled with energy. I was doing great! I was going at a pretty good clip, talking to people and smiling all the way. About half way through the race a somewhat portly old man came up beside me and then left me in the dust! I stopped talking to people and the smile turned to my teeth being clenched together as I turned up the speed. But the tank was empty. There was nothing left within me. I had started the race with so much but like a balloon I let it all out at once. I had nothing left. I finished the race with what seemed to be a group of granny's decked out in pink bows and t-shirts! You and I have four days left. My prayer if that we would have paced ourselves properly so that we can finish this year strong. Don't let the year end with anger in your heart. Don't cross into 2010 with that root of bitterness still growing. The way you leave this year will determine how you enter next year. Clean up your messes. Be forgiving and ask for forgiveness. 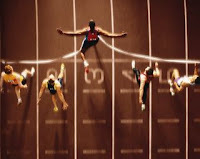 Run the race in such away as to win. Four days left...will you finish strong?